Recently my daughter Gillian brought me some fresh sour cherries. Cherries that are intended for baking, not eating out of hand. I love sour cherries. In fact I like most foods that are sour -- anything that provides that satisfying pucker in my mouth. Mostly, I like sour cherry pie, but I didn't have enough fruit. Also, I don't have a cherry pitter. Thanks to some instruction at The Spruce, I learned how to remove the cherry stones using a pastry tube tip, so I decided to make two individual Sour Cherry Crisps. Notice that the amount of sugar I use is less than what you'll see in most recipes. The point of sour cherries -- for me -- is that they are supposed to be sour, merely mellowed by sugar, not overwhelmed by it. But, by all means, if you like your desserts more on the sweet side, you can add more. Preheat the oven to 375 degrees. Place the cherries, sugar and cornstarch in a bowl and mix to coat the cherries completely. Spoon the cherries into 4 baking ramekins (or a small baking dish). In a bowl, mix the oats, all-purpose flour, brown sugar, cinnamon and salt until the ingredients are evenly distributed. Pour in the butter and mix to coat the dry ingredients. 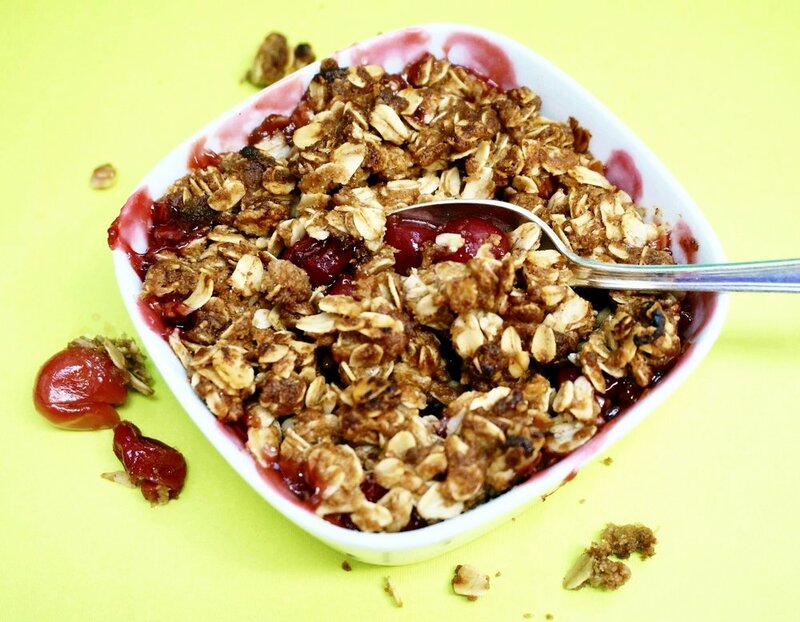 Spoon equal amounts of the oat mixture on top of the cherries. Bake for 28-30 minutes or until the top is crispy and golden brown. Older PostBaked Beans. Real American Food for the 4th.